Pure IP has launched a WebRTC service offering to expand the communication technologies to global customers. SIP Trunking and WebRTC are complementary technologies, and when they are combined, they can offer new opportunities in managing Company Communication. WebRTC enables real-time communication over peer-to-peer connections. It essentially turns any browser into a phone by utilising the inbuilt real-time protocols without the complexity of installing add-ons or having to use a 3rd party voice application. Pure IP believe it will offer our customers the ability to provide another secure and robust method for communication. Pure IP is offering the WebRTC solution as a complementary product to our global SIP trunking service so it can provide our users with more communication options. 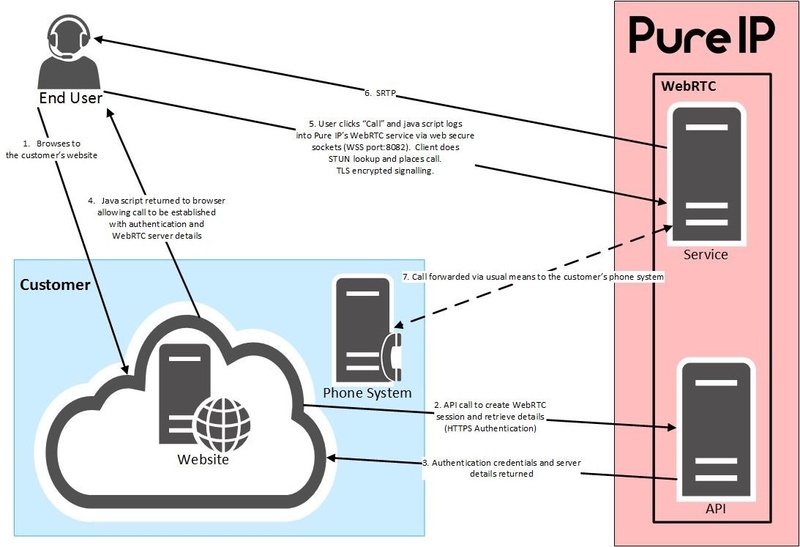 The key differentiator to the Pure IP WebRTC service is that we will manage the WebRTC session and deliver the call to the customer's environment as a standard SIP call. This innovative approach requires the minimum amount of changes on the customer’s side and with little effort, provides a new secure communication channel.